This is really major news, especially for self-publishers! 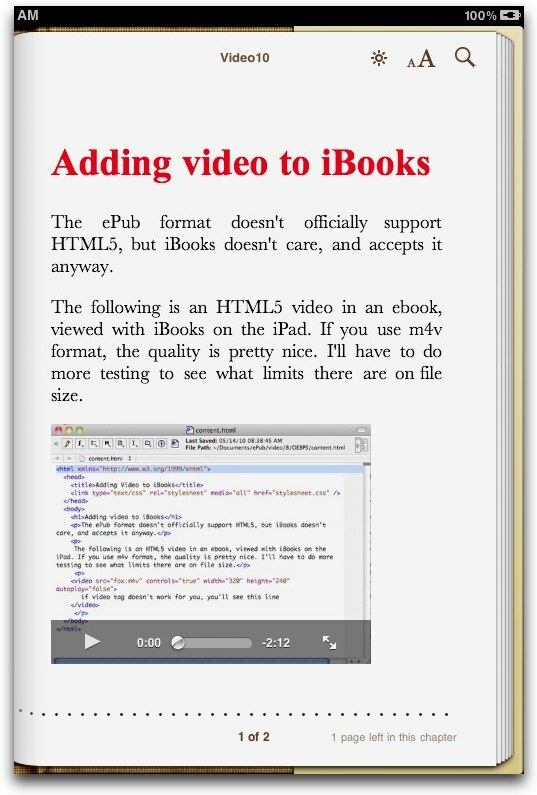 HTML5 Video Works on iBooks on iPad!! Liz Castro has really been doing some magnificent work, testing the limits of ePub on the iPad. And now she’s discovered the way to embed video in an ePub that will work on the iPad in iBooks! At Liz’s blog is also a link to a sample ePub with embedded video. But still, this is an incredible development. It gives just about everyone the ability to create Vook-like digital books without having to wait for Apple to pull out its thumb and modify Pages for that task. This also frees everyone from a reliance on Apple to create digital books. This is a freedom not enjoyed by app developers who must adhere to Section 3.3.1. The one sore point for me is that the controls are visible and fugly. But I suppose a method can be devised to modify that in the future. One important point: Remember that the iPhone will have iBooks too this summer. It has a smaller screen than the iPad (duh!). Make sure videos won’t run off its screen. Bookmark Liz’s blog to keep up on breaking developments about video sizing. This entry was posted in eCrap ePub eBooks, Video, Writing. Bookmark the permalink.